This lovely, vintage transportation image is from 1910. Can you guess what they were advertising? It wasn’t the sleigh. It was the plush robe keeping the two passengers warm. This Victorian tradecard was published by the 5A Horse Blankets company. It is a shame that the image isn’t more clear but I think it would still make a great Christmas card image or represent early modes of transportation. And, of course, there is the stunning horse that’s drawing the red sleigh across the snow. 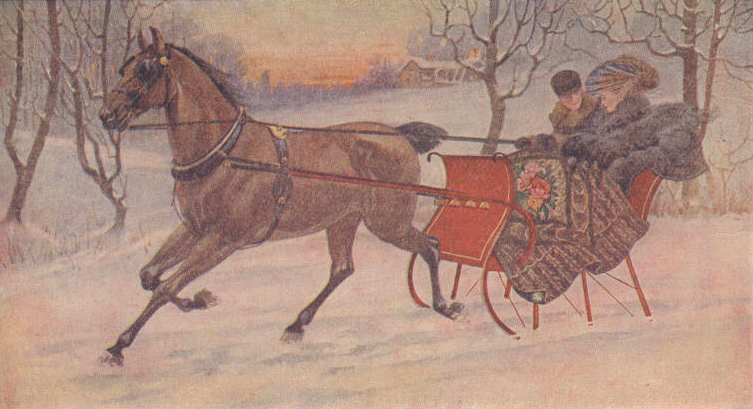 The gentleman driving the sleigh appears to be asking his female companion if the lovely blanket and furs that she is draped in are keeping her warm. Off in the distance is a colorful sunset. One wonders if they are going home from a day’s adventure, on their way to a gathering of friends or just enjoying a winter sleigh ride.